Every December, people in Yellow Springs can share the joy of the holidays by anonymously requesting or giving food and gifts. It’s a simple and elegant process, begun almost 30 years ago by Marianne Bebko, Ogla Harris, and Juanita Richardson. 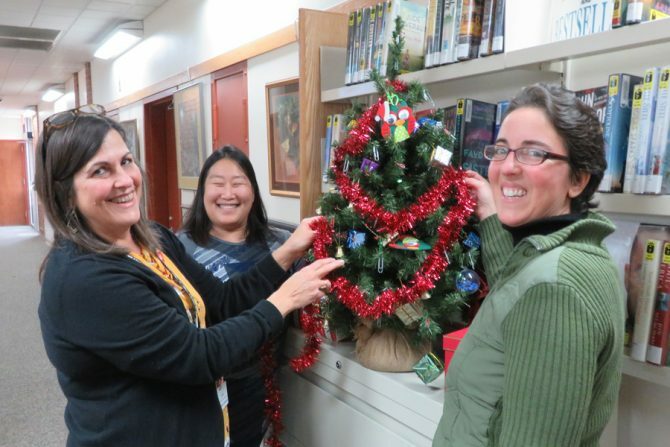 Around Thanksgiving, the Share the Joy tree goes up at Yellow Springs Community Library. For a couple of weeks, families or individuals in need can anonymously request specific gifts and/or grocery gift certificates by placing request forms in a box next to the tree. Volunteers create a tag for each requested item and hang the anonymous requests on the tree. Shoppers from the community spring into action to select tags, shop for the gifts, wrap them, and deliver them to the library with tags attached. Just before Christmas, recipients pick up their gifts at a designated time and place. For donors and recipients alike, Share the Joy has become a popular holiday tradition. When a former recipient is able to become a donor, it is a touching moment. This year, local residents could request assistance through December 1, and now you can drop off gifts through December 14. If the deadlines have already passed when you’re reading this, please know that there will be another chance next year. For more information, pick up a brochure at the Yellow Springs library. Thank you to everyone for sharing the joy!